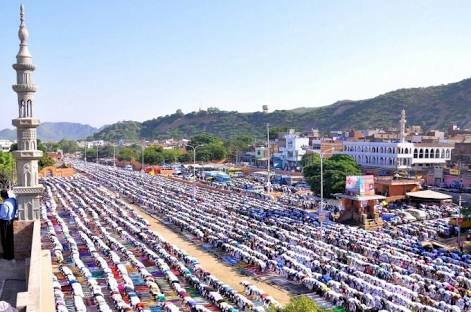 Eid- Celebrating in Jaipur with the Quintessence of Harmony and Brotherhood. Eid is a sacred celebration when the Muslims come together and hug each other with promises of charity, kindness, harmony and brotherhood. This festival is not about being happy but to make others happy and nurture their desires. The Islam community from all across the globe shows their gratefulness to Allah for everything they own. There are two kinds of Eids that are celebrated throughout the globe with great fervour and fun. Eid-ul-Azha honours the end of the Haji Pilgrimage. Both are celebrated all over the world by Muslims. On the day on Eid-ul-Adha, the markets in Jaipur city are upbeat with activities, and markets are busy and shops won’t close day and night today. The old walled city bazaars of Jaipur are overcrowded with shoppers. Markets are flooded with the new essential items required on the day of Eid. MUSLIMS ARE busy buying sacrificial animals, food items, clothes, bangles, household goods and gifts. One can see the rush of people at bakeries, confectioneries, readymade garments outlets, cosmetic shops, shoe shops and toy shops. At many places in the walled city, roadside vendors are selling varied merchandise related to the festival. The literal meaning of Eid al-Adha is the ‘Feast of the Sacrifice’. It is one of the most important Muslim festivals to honour the willingness of the prophet to sacrifice his young first-born son Ishmael as an act of submission to God with consent from his son but with the intervention of Abraham a ram was sacrificed instead. Eid al-Adha begins with a Sunnah prayer of two rakats followed by a sermon with the Eid in the morning and sacrifice after sunset in the evening. At the conclusion of the prayers and sermon, the Muslims embrace and exchange greetings with one other by saying ‘Eid Mubarak’, give gifts to children, and visit one another and friends in various communities. ← On the auspicious day of Eid al Adha, The Jaipur Explore team would like to wish you and your families a very happy Eid Mubarak.